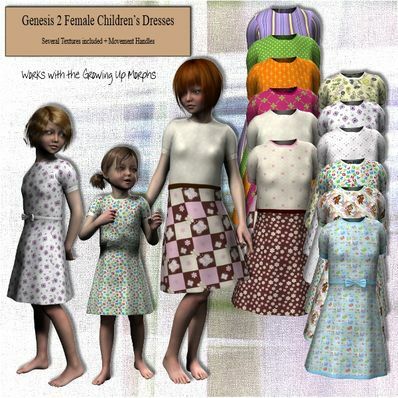 Children's Dresses for Genesis 2 Female for use in Daz Studio 4.6. Thanks a lot 4 sharing your talent! Thank you, yet again, for your excellent work and generosity. I just finished reading the forum for the product Growing Up for Genesis2, and came across this very nice set you're offering. Also the swimwear, very nice. Now it's time to try to study these things and see if I understand correctly. Thank you very much for your work. (I'm learning Blender3D, and hopefully someday will also produce products for folks). Cheers!